Imperial Airways Ltd began on 31 March 1924 after the Hambling Committee, appointed to look into British air travel by the government, decided to offer the current British airlines a subsidy of one million pounds over ten years to merge into a unified national airline. The stipulations were that the new airline must only use heavier-than-air machines (aircraft rather than airships) and these machines must be of British design. The Instone Airline who had a single Vickers Vimi Commercial aircraft. The Daimler Airway who flew seven De Havilland DH 34 biplanes. British Marine Air Navigation Company (BMAN) who flew two Sea Eagle aircraft. Handley Page Air Transport who had a fleet of three Handley Page W.8b aircraft. These four airlines merged to form Imperial Airways Ltd making Britain the first country to form a national airline. The aircraft were old and of little real value for the route network that was being considered for the new airline. It actually didn't make much more progress until the 1930s on furthering the European network but concentrated on the long-haul routes to India and Africa. 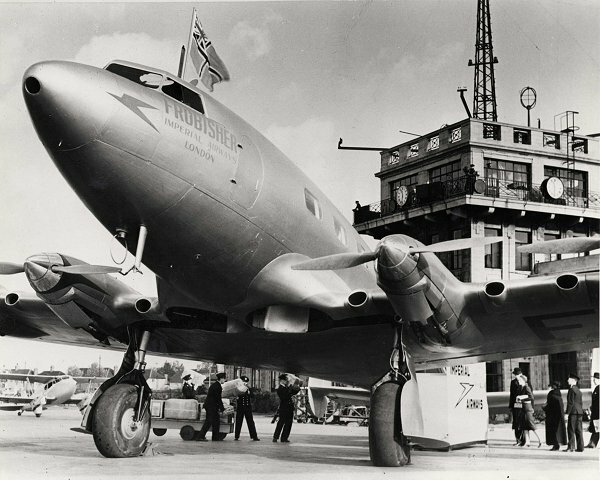 A new British airliner that was introduced into line service in 1938 was the sleek and attractive De Havilland DH.91 Albatross, Frobisher Class airliner. Built of wood in an age of metal airliners like the Douglas DC-2 and DC-3 the Albatross set new speed records across Europe and cut the travel time from London to Paris down to (what was then) an amazing one hour. Imperial Airways Ltd never really lived up to the ideals that set it up in 1924. Air France, KLM and Deutsche Luft Hansa were well ahead in Europe. It was concluded that the airline's poor standing among its competitors was due to poor relations with its staff, inefficient operations and obselete equipment. Recommendations were made that the airline should continue to operate the long-haul routes but the European routes should be passed on to the newer and more competitive British Airways who had a more modern fleet. This despite the fact that the airline's original terms of reference did not demand that it commercial battles with foreign airlines. Unfortunately then, as now, the airline business is a highly competitive one. Shortly after this a further decision was made to merge Imperial Airways Ltd and British Airways into a new state-owned national airline and so British Overseas Airways Corporation - B.O.A.C. - was formed on 24 November 1939 and Imperial Airways Ltd ceased to exist. 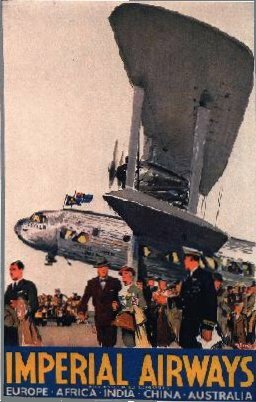 Despite the failure of Imperial Airways Ltd to capture the opportunities in Europe its successes on the long-haul routes to India, the Far East and Australia (with an experimental flying boat service to New York too) make Imperial Airways Ltd one of the few that formed what we now know as our world airline network, along with KLM, Air France, Luft Hansa, Pan American, United, and a handful of other giants. I attach two Jpg images of the Frobisher Class Albatross aircraft. These images were taken in the late 1930s and so I have no copyright information. I would guess that the airborne dh91 was taken by the airline itself (now British Airways). The picture at Croydon is clearly a camera on a tripod and was more than likely also taken as an advertising image by the airline. If you wanted to link to this page on the history website I would prefer you linked to the main page. This is because pages on the website do change from time to time as I make changes (and Imperial is due for a major redesign with more information and better images).